Construction of Customs and Border Protection’s eight new Cape Class patrol boats is on time and on budget, the Australian Minister for Home Affairs Jason Clare said at the first boat’s keel-laying ceremony in June. "Austal has now finished the design stage and the delivery of Customs and Border Protections’ new patrol boats is on track," Clare said. 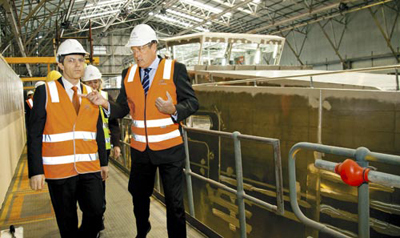 "Austal are doing a terrific job — delivering the boats on time and on budget." The keel-laying ceremony is an important, age-old tradition, where coins are placed upon a keel block on which the hull modules will rest. Keel laying traditionally marks the first significant milestone in a ship’s construction. Historically this was the "laying down" of the main timber making up the backbone of a vessel. Austal’s shipbuilding techniques means fabrication of ship modules begins well before they are actually joined. So today Austal celebrates keel laying when modules are brought together for final assembly. Speaking at the ceremony, Austal CEO Andrew Bellamy said the Cape Class Patrol Boat Program was demonstrating Austal’s broad capability and world leadership in the defence field. "Like our US Navy projects, this program shows that Austal can do more than design and manufacture world-class ships," said Bellamy. "We are also taking the prime contracting role and using in-house expertise to develop and integrate sophisticated electronic systems for command, control and communication. We are also building on our existing capabilities to establish and operate a comprehensive and effective in-service support system for the fleet. "This is the Australian Government getting the best possible value regardless of supplier nationality, and that’s the basis upon which we secured this work. "The fact that we are on track to deliver that capability, as promised, is a credit to all involved. It reflects the skills and hard work of our staff, many of whom bring invaluable experience from previous government contracts carried out both here in Australia and at our US shipyard," he said. 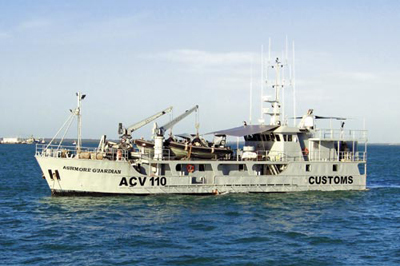 Construction of the first Cape Class Patrol Boat will continue in accordance with schedule, the launch due in December this year prior to sea trials and delivery to Customs and Border Protection in March 2013. Top photo: The first Cape Class Patrol Boat is now in assembly phase. Andrew Bellamy (right) shows Jason Clare the Austal facility. The Australian Defence Force has now officially taken ownership of its new humanitarian and disaster relief ship, Skandi Bergen, which will be renamed Australian Defence Vessel Ocean Shield. Defence took ownership of the vessel after extensive sea trials oversighted by international shipping firm Teekay Shipping. The ship was expected to arrive in Australia during July after delivery from Norway. 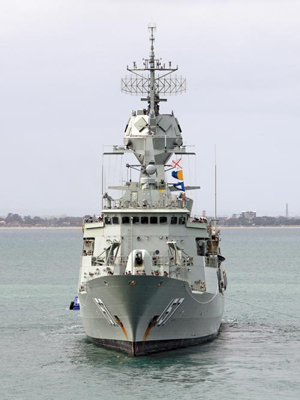 It is anticipated it will be available to the Royal Australian Navy for tasking upon its arrival. The vessel is the sister ship of Ocean Protector (pictured below), which is currently operated by Customs and Border Protection and will transfer to that organisation in approximately 2016. Tasmania’s salmon industry is on the verge of a major expansion worth tens of millions of dollars in Macquarie Harbour on the State’s West Coast. The Tasmanian Government has approved plans by local major salmon producers to increase marine farming leases that have the potential to triple production. The farming area would be increased to 926 hectares taking up 3.3 per cent of the harbour, an increase of just over one per cent. "Tasmania’s salmon industry has been a great success story and the expansion will be a huge boost to the West Coast and the broader Tasmanian economy," said Bryan Green, the Minister for Primary Industries and Water. The expansion is expected to contribute more than $88 million into the regional economy in the first five years, and create 100 jobs during the construction phase. A further 160 production and processing jobs would follow the expansion of the farming areas. Green congratulated the project partners — Petuna Aquaculture, Tassal, and Huon Aquaculture — for their vision and hard work on the project. He said the environmental assessment of the expansion was the most extensive ever undertaken in Tasmania for a marine farming development, and he approved an amendment to the Macquarie Harbour Marine Farming Development plan recommended by an expert panel that examined the proposal. "The amended plan has now been provided to the Commonwealth for consideration under the Environmental Protection and Biodiversity Conservation Act," Green said. Salmon farming began in Macquarie Harbour in the late 1980s and production this year is expected to reach 8000 tonnes. The Federal Budget provides $33.3 million for the operation of two new vessels for the Australian Customs and Border Protection Service. One is the humanitarian and disaster relief ship previously acquired by Defence, which will transfer into Customs and Border Protection in 2016, while the other is a dedicated surveillance and response vessel to be located at Ashmore Reef. Being acquired to replace the Ashmore Guardian (pictured below), the new Ashmore Reef boat is being procured to provide an effective surveillance capacity around the reef into the future. The Government will provide funding of $19.831 million (excluding capital costs) for the so-called Long Term Ashmore Reef Capability to maintain the capability currently provided by Ashmore Guardian. This is considered vital to support the effort against both people smuggling and environmental degradation (including illegal foreign fishing) in and around the area. Capital funding will be published following the finalisation of the procurement exercise, which is anticipated will be undertaken in the second half of 2012. A total of $13.47 million is allocated over two years to fund the Southern Ocean ice-capable patrol boat as a humanitarian assistance and disaster recovery capability vessel. Currently named Skandi Bergen, but to be re-named Australian Defence Vessel Ocean Shield, the 6500-tonne offshore support ship is 105m long and 21m wide. It has accommodation for up to 100 people, more than 1000m² of deck area, and a helipad. Attorney-General Nicola Roxon said the ship’s primary role for Customs and Border Protection would be to protect Australia’s interests in the Southern Ocean. 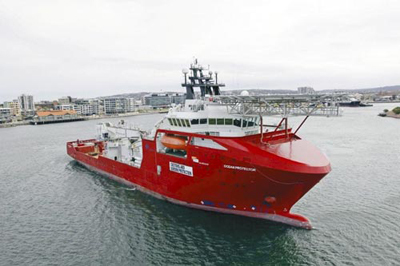 "The vessel is able to operate in sub-Antarctic weather conditions making it ideal for the work it will undertake in the Southern Ocean," said Roxon. "The patrols that it will undertake are key to securing our economic and territorial interests." Minister for Home Affairs Jason Clare said the ship would deliver a long-term capability for Customs and Border Protection. "This is about ensuring that Australia’s interests in the Southern Ocean are protected into the future," Clare said. "The ship’s job will be to provide surveillance, detection and apprehension of any other vessels operating illegally. "That means protecting Australia’s interests in the Southern Ocean maritime against threats like illegal fishing," he said. Perhaps understandably given that the Government had previously announced the commissioning of a new Defence White Paper, the Federal Budget provided little guidance on potential impacts on Navy spending. This despite the fact that it followed a comprehensive review of the Department’s budget "to identify contributions Defence could make across the Forward Estimates to support the Government’s broader fiscal strategy". This review has resulted in a Defence contribution to the Government’s fiscal strategy of $5.454 million across the Forward Estimates and will see Defence contribute $971 million in 2012-13. Defence has reallocated and reprioritised $2.9 billion, the majority of it from savings in the Defence Capability Plan and the Approved Major Capital Investment Program, with further savings, predominately in 2012-13, from across the general Departmental operating budget. Although some specific measures have been announced, how this will be achieved is not entirely clear. Operations and personnel numbers will not be adversely impacted, according to the Government, and the "reprioritisation of Defence expenditure has been designed to have minimum impact on the delivery of core Defence capabilities". Overall the Government said that: "A number of lower-priority capability projects will be deferred with a small number cancelled where they have been superseded by alternative capabilities. Other capability and facility programs will be subject to re-scoping. A range of administrative and minor capital equipment savings will also be made." • $700 million additional investment in Collins Class submarine sustainment. • $270 million additional funding for Navy fleet sustainment. • Navy reprioritising its operating activities and reviewing all non-operational activities including Navy’s international program. • Minor Capital Projects: $45 million from reduced expenditure in 2012-13 only on Navy, Army and Air Force minor capital equipment programs. Defence confirmed it will progress a number of core White Paper 2009 projects in 2012-13, including upgrades to ANZAC class ships. A number of projects will be progressed that aim to enhance the availability and capability of the current Collins Class submarines. In addition, the Government has undertaken initial consideration of the Future Submarine capability and approved $214 million to go towards further detailed studies and analysis to inform the Government’s decision on the design of Australia’s next submarine. Budget cuts do not affect the ANZAC class anti-ship missile defence upgrade. Three 21m catamarans recently completed by Austal are understood to be the first Australian-built wind farm support vessels. Now in Europe, they have joined the fleet of UK operator Turbine Transfers. The Wind Express 21 catamarans will be used to transport service crews and equipment to the many offshore wind farms that are located off the coastlines of several European countries. Turbine Transfers has confirmed that one will operate from Belgium, while another will work within the London Array wind farm. Foryd Bay, Malltraeth Bay, and Aberffraw Bay are the first in the Turbine Transfers fleet of 27 vessels to be commissioned outside the United Kingdom. 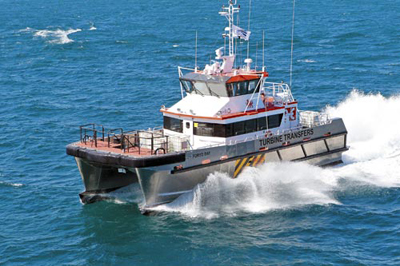 Turbine Transfers is a wholly owned subsidiary of Holyhead Towing Company, which has been operating workboats since the early 1960s. Its long-term customers include Siemens, RWE NPower, Van Oord, Dong Energy, EnBW and Royal Boskalis Westminster. Managing director of Turbine Transfers, capt Mark Meade commented: "We have been very happy with the construction of the three 21m vessels by Austal. Their professional approach has ensured a smooth process throughout the construction and delivery period. "The vessels have performed well on trials meeting performance expectations, and we are especially pleased with the exceptional seakeeping coupled with the hulls ability to carry additional deadweight with a minimal loss of speed, provided by Austal’s fine entry Z-bow hullform," said Meade. Austal Chief Executive Officer Andrew Bellamy said the delivery of the company’s first wind farm boats marked a successful entry into a new and buoyant market. "We are very pleased that such a highly experienced operator will soon be showcasing the capabilities of Austal vessels in service. We are confident that when other European operators see how they perform they will also recognise the benefits Austal brings to the offshore wind farm vessel market," said Bellamy. "These three vessels are the result of extensive research and development, building upon Austal’s advanced hull design and engineering capabilities. The Wind Express 21 workboats demonstrate our extensive intellectual property with the design of highly efficient vessels that will achieve greater speeds while using less fuel," he said. Bellamy noted that those benefits extended beyond providing safer, more productive vessels for Europe’s wind farm operators. "Austal is able to provide high-quality, in-service support for wind farm vessels, including boats not built by Austal that may require maintenance, repair or modification. We already have a well-established European Service Centre and plan to grow our regional support presence further, including in the UK," Bellamy explained. Austal said the workboats are specifically designed for operation in rough sea conditions, and offer stability and fuel efficiency through the "highly-refined catamaran hull form, which requires less power and fuel to meet operational requirements". "In association with a high tunnel height, Austal’s advanced Z-bow chine hull form enables the vessels to operate at speeds of up to 30kts, with targeted seakeeping ability in up to 2m significant wave height," the company said in a statement. The vessels are each powered by two MTU 10V 2000 M72 diesel engines driving Rolls-Royce 45 A3 waterjets. The Wind Express workboats’ arrangement enables transits for up to 12 wind farm personnel, with a high-quality interior fitout, good visibility and ample fore and aft cargo stowing, as well as accommodation for the crew. Austal has a fourth wind farm support vessel, a 27m TRI SWATH, under construction for Turbine Transfers at its shipyard in Cebu, Philippines. Due for delivery in late 2012, this is the first of a new design that capitalises on Austal’s expertise in trimarans to enable an even safer and more efficient offshore wind turbine service. An Austral Wind Express 21 catamaran, three are now in Europe. Compact bridge aboard a Wind Express 21. Functional food prep and mess area, while suspension seats in the background are provided for personnel in transit. Having recently received the services of a new fisheries patrol vessel, Western Australia’s Houtman Abrolhos Islands will get $2.1 million in new infrastructure. The archipelago consists of more than 100 coral islands and is located about 60km off the coast of Geraldton. A sum of $580,000 has been allocated to replace the deteriorating Rat Island jetty, which builds on $1.5 million set aside to upgrade the East Wallabi and Beacon Island jetties. Rat Island jetty, which was built in the mid-1960s, will be replaced to support integral services for the Saville Kent Centre operations on the island. The Centre, owned by the Department of Fisheries, provides primary logistical support in the management of the Abrolhos Islands. The new jetty will be the principal avenue for deliveries of the equipment and supplies needed to maintain the facility. Rat Island also has an airstrip that is strategically important to the Abrolhos and also needs maintenance, so the new jetty will be more suitable to unload and transfer heavy equipment required for the repair work. In the last three years the WA fisheries department has introduced fisheries management changes that have increased its service delivery and field presence at the Abrolhos, resulting in a greater use of operational sites and associated jetties at the Abrolhos Islands. "It is particularly important for the commercial rock lobster industry," said the State’s Fisheries Minister, Norman Moore. "Added to that, a growing non-commercial fishing presence over the last few years has also required greater departmental activity, increasing the need to extend the East Wallabi jetty to accommodate larger vessels." Moore recently named a new 10m patrol vessel to support the department’s expanding operational needs. The new boat was named Pelsaert to revive a link with a Fisheries patrol vessel used between the 1970s and 1990s as well as Francisco Pelsaert, the Dutch captain who commanded the Batavia, wrecked at the Abrolhos Islands in 1629. The Minister said Pelsaert would be used to expand operational capabilities. "The Houtman Abrolhos Islands is an A-Class Reserve and the department plays its part in ensuring the conservation of the area, but also overseeing tourism and recreational fishing and the commercial fishing and aquaculture industries that depend on it," said Moore. "This new vessel will have the ability to patrol the extensive shallow coral reef areas at the Abrolhos to undertake compliance, research and management activities." Local companies Southerly Designs and Western Boat Builders were contracted to design and construct the rigid inflatable boat. "Purpose-built for its role, the patrol boat has bigger deck space than the standard rigid inflatable design, so it can carry equipment on the deck without the pontoons being damaged by rock lobster pots and contract equipment," Moore said. "The new vessel is capable of operating independently from other Department of Fisheries patrol boats at the Abrolhos Islands — the PV Chalmers and PV Houtman — enabling a higher level of service delivery." One of the fast ferries operated by Rottnest Express to the eponymous island off the coast of Western Australia is being offered for sale. Sea Eagle Express, a 30m aluminium monohull built in 1996 by SBF Engineering, is available for immediate delivery. The ferry is in current Uniform Shipping Laws survey for 243 passengers and provides a service speed of 24kts. Power comes from three MTU 12V 183 TE 72 engines, each rated at 610kW and driving fixed-pitch propellers. 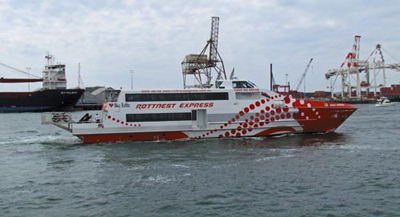 The ferry is the smallest and oldest of the three in the Rottnest Express fleet, the others being the 39m StarFlyte Express and the 35m Eagle Express (below). Sydney-based naval architecture firm Incat Crowther continues to record great overseas success, most recently in the form of major contracts for large aluminium offshore vessels. The company has been awarded a contract to design a fleet of 48m monohull Fast Supply Vessels (FSVs). In a significant order that demonstrates market confidence in Incat Crowther’s offshore expertise, a total 12 of these vessels will be built in Brazil, where they will also operate. Ships fuel will be in excess of 40,000lt, while it will carry a cargo fuel load of 90,000lt. The vessels will also be able to carry 90,000lt of cargo freshwater. The vessel is dominated by an expansive aft deck of 225m² of usable area, with an additional 30m² of cargo area inside the main deck cabin. For crew there is a small meeting room and other facilities like a wet room and laundry. Below decks are six cabins accommodating 11 crew, as well as a mess, galley and bathrooms. 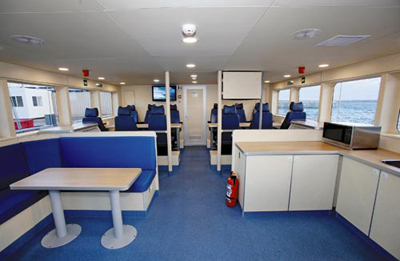 The upper deck wheelhouse includes an aft-facing control station allowing for safe and efficient manoeuvring. Each vessel will be powered by four 1800hp Cummins QSK 50 main engines. Fixed-pitched propellers have been selected for propulsion, giving the vessel a service speed of 21kts. Two 150hp electric tunnel bowthrusters will enhance manoeuvrability. Incat Crowther has also confirmed that two 55m catamaran crewboats are under construction to its design in the USA. The vessels’ operator, SEACOR Marine, was among the pioneers in the use of fast catamarans in the offshore industry and intends to push the boundaries even further with these larger, faster vessels, by offering increased capacity and comfort. The workboats will each be powered by four MTU 16V4000 M73L main engines, which will drive Hamilton HT-810 waterjets, giving speeds in excess of 46kts. The combination of four reversing jets and two retractable azimuth thrusters, coupled with a Kongsberg control system, provides the vessels with dynamic positioning in a wide operating area. The vessels will have DP3 capability. Extensive seakeeping studies indicate the design reduces motions by an average of 20 per pent, with vertical acceleration reduced by 40 per cent. The vessels will have the capacity to carry 150 tonnes of deck cargo, and the main deck passenger cabin seats 150 personnel. The hulls accommodate 14 crew in a mix of officer and non-rated cabins. The port hull features galley and mess facilities. 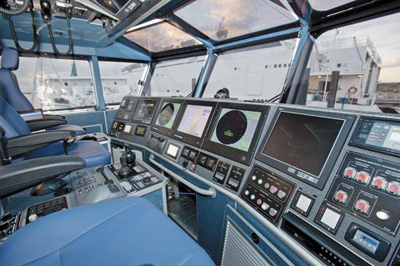 The upper deck wheelhouse features forward and aft control stations. 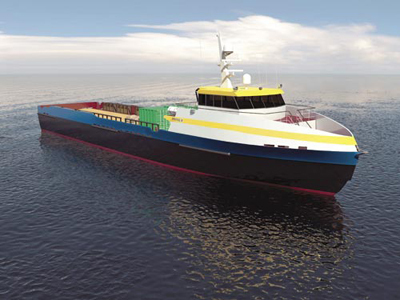 Twelve Incat Crowther designed 48m monohull FSVs will be built in Brazil. 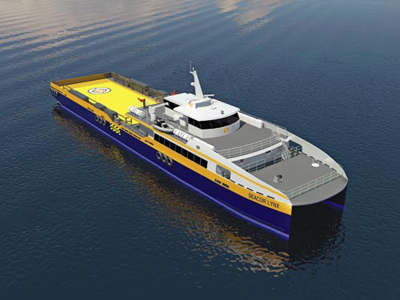 Incat Crowther has also confirmed that two 55m catamaran crewboats are under construction to its design in the USA for operator SEACOR Marine. The Western Australian Government has moved to assemble the land required for the Pilbara’s next major deepwater port and industrial precinct. Anketell Port, 30km east of Karratha and 10km from Cape Lambert, is to be developed in stages as a multiuser facility with an ultimate annual export capacity of more than 350 million tonnes. The development includes a related industrial precinct to accommodate mineral processing and other heavy industry. The approximate land requirements for the Anketell project include 1700ha for port operations, 1760ha for transport and service corridors, and 840ha for industrial areas. WA Premier Colin Barnett said the Government had issued notices identifying 4300ha required to enable the development of the Anketell Port and Strategic Industrial Area. The land is currently covered by various forms of tenure, including native title, pastoral leasehold, private land and mining tenements. "Anketell will generate new business and development in the Pilbara, with existing towns, especially nearby Karratha and Roebourne, providing services and homes for the operational workforce," said Barnett. The Premier said the Government was considering a range of options for how the staged development of the port would proceed. In 2011, annual iron ore exports from the Pilbara totalled 452 million tonnes and are forecast to reach 900 million tonnes by 2020. From Trade-a-Boat Issue 429, July-Aug 2012.